Q: The Diary Arts Center in Boulder has really transformed in the last few years! Can you give us an overview of your mission and purpose? A: The Dairy Arts Center is Boulder’s largest multi-disciplinary community arts center. It houses arts organizations such as theatre and dance, and includes art galleries, performance venues, teaching and dance studios, a cafe and an art-house cinema.We are in the final stages of a major renovation and will finish next summer. Q: How has The Dairy used Colorado Gives Day to support fundraising? Q: How did you promote the match? Photo of matching grants donors makes the "ask" more personal. The Dairy's share of the $1 Million Incentive Fund. A: The match was from prominent, well-known arts supporters and helped us pull in another $20,000 in donations. In addition to a direct mail postcard and emails, we used lots of social media. 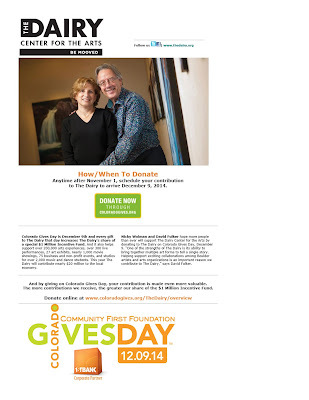 We included a photo of the donors and a personal appeal that I think resonated with people. Q: That’s a beautiful card and I love the message, “Your gift on Colorado Gives Day gets our heart pumping”! The bullet points really convey the magnitude of the Center’s contributions to the community. A: I was a new employee in 2013 when we participated in our first Colorado Gives Day, and creating our ColoradoGives profile helped me learn a lot about the Dairy. It’s just a three-person team working on the event—me, the marketing director and ED--so that first year I took advantage of the marketing materials and educational videos in the Nonprofit Toolkit and followed the best practices. In our second year (2014) we based our promotion around a $20,000 match we received. Q: What did you do last year? A: Well, last year was amazing because our building was under construction, and we tied our capital campaign/renovation message to Colorado Gives Day. We created a two-color postcard and re-purposed it in emails. Q: We always recommend including the Colorado Gives Day logo since the branding is becoming very recognizable. You did a nice job with the Incentive Fund and scheduled donations messaging too. A: Thanks. We also did an on-site event on Colorado Gives Day last year in The Boedecker, our art house cinema. Our Executive Director, Bill Obermeier, gave three presentations about what to expect with our newly renovated Dairy Arts Center. We had a laptop to take online donations. One hundred people came and we received campaign gifts that day. We also had Colorado Gives Day signs and posters everywhere. Q: What have your overall outcomes been like? A: Our results have steadily grown: 95 donors and $8,000 raised in 2013, 124 and $20,000 raised in 2014 and $25,000 from 149 donors in 2015. Colorado Gives Day has raised the most money for us in a campaign—particularly in one day. But we’re also excited that we’re seeing new donors each year. That’s why I love Colorado Gives Day—seeing all these new names. Q: Do you steward these new donors? A: Absolutely. We send "thank you" postcards with personal notes to all donors that day. Our board and executive director make phone calls to people who donate $500 or more. And the very next day we send a social media blast about total giving. Q: What have you attributed to the growth in giving? A: Each year we try to do something bigger and better. The donor match in our second year boosted us up from the previous year. Q: What are your plans for Colorado Gives Day this year? A: Since the grand opening of the renovated building is in September, we’ll be tying the two events together. I want to involve our volunteers and board members more—maybe create a staff campaign and use them as advocates. I also want to use more social media. In August we plan our goals and strategy. A: I love the hype of Colorado Gives Day!